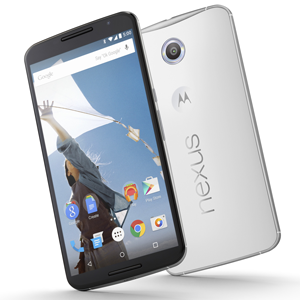 The Nexus 6, released in Q4 2014, is manufactured by Motorola, is Google's first phablet handset, and is one of the first devices to get Android Lollipop. The Nexus 6 features a large 5.96" AMOLED QHD display, with a resolution of 1440 x 2560, giving it an impressive 493 ppi pixel density. It's powered by a Qualcomm Snapdragon 805 quad-core 2.7GHz processor, with 3GB of RAM, and either 32GB or 64GB of internal storage. The Nexus 6 shooter comes in at 13MP, with optical image stabilisation and a twin-LED ring flash, for clearer photos in low light conditions. Other features include a 3220mAh battery and a bundled Motorola Turbo Charger for a quick battery charge.